I’ve been teaching “Agile Projects” (yes, the title does feel a bit strange) to undergraduate students for a few years, and I’ve always took that opportunity to spend half a day on TDD. That meant me demo’ing a test-first implementation of FizzBuzz, then letting the students take a stab at the Fibonacci series. Yes, all very run-of-the-mill stuff. Understandably, I was always worried that concepts would not be really understood. This year, I decided to try out Cyber Dojo, a website by Jon Jagger that is essentially a bare-bone IDE, streamlined for TDD. For this, I baited the students by offering bonus exam points for those who submitted the exercise. Also, the exercise was to be done on their own time. Cyber Dojo is not particularly designed for running exams, and it was lacking around the edges, but it does seem to do the job. The way it works is by letting the student selects a pre-packaged environment (Java+JUnit, say, or PHP+PHPUnit, or even Erlang+eunit). They would also chose a particular kata from a list of 20 or so, made of well-known exercises. The environment is set up with a simple code file, a test file, and an instruction file. There is also a file containing the output of the test execution and a script for the adventurous who wants to tune how the tests are run. That’s it. No refactoring tools, no syntax highlighting, no reformatting. Just you and the code. All the student can do, after modifying code, is run the tests. 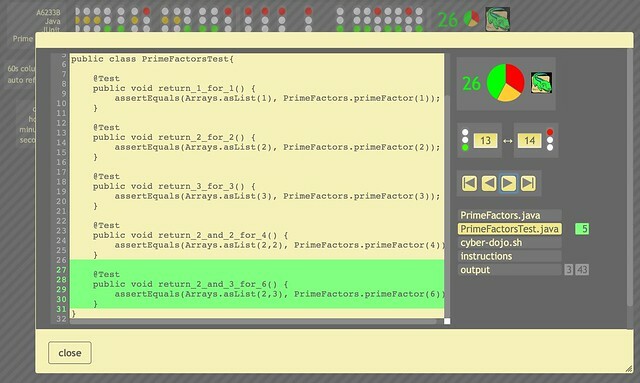 The results are recorded in the output file, and a traffic light icon is displayed in red, yellow or green. It is up to the student to decide when the kata has been completed. The plan has been to point them to the site, and ask them to email me the identifier for their exercise: the “dojo id” and “animal name”. It is possible for several students to share a dojo, but I figured that encouraging them to start a new dojo each would reduce the risk of cheating by copy/paste. Upon receiving the dojo details, I would review the sequence of red/green lights (an ideal series would be a repeating sequence of red/green/green, representing writing a test that fails/writing code that passes the test/refactoring), then read the code modified at each step. This would let me see whether the code was truly designed using baby steps — and would let me easily weed out those who copy & pasted the solution from the internet. Finally, I would then write up my thoughts and email them back to the student. Those who did the exercise early had a chance to do it again, with the benefit of my comments. One drawback of reviewing TDD exercises, is the time it takes to review the results. It takes me almost 20 mins to read, assign scores, and send comments to the students. With 80 students, that would in theory take more than 24 hours of work. I mitigated this by making the exercise optional and also allowing students to work in pairs. I still got a good 30 to review. What I saw was not very flattering to me as a teacher… but that would be a topic for another post. A couple of weeks ago, I organized a workshop based on MaKey MaKey from the 20 children in my daughter’s class in kindergarten. The children were born in 2009, so were around 5 years in age. 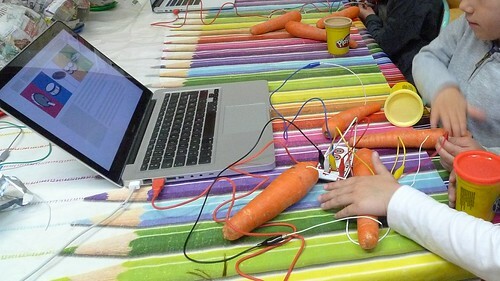 The plan was to demystify computers by letting them see electronics (the MaKey MaKey kit) and interact with them in fun ways. 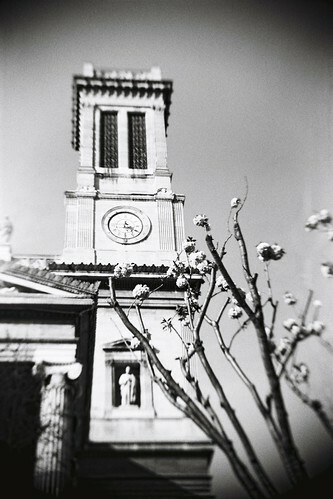 This is mostly a step-by-step account of what I did, in the hope it might inspire others. I started with an overall introduction on computers: “have you seen a computer before?” “can you point me to one?” (I made sure to explain that my smartphone was also a small computer). On the question “what can you do with computers?” I got the expected responses, that is, mostly passive usages such as listening to music (by far the most popular answer), watching movies. Perhaps surprisingly, only one mentioned playing games (this makes sense, since at this age, they are still too clumsy with keyboards; games on tablets work better). A bit disappointingly, a single child mentioned non-passive activities: “looking for cars to rent for the holidays” and “sending letters to people far away” (plus, this was from my own daughter so it didn’t really count). “Writing letters” was the cue I was hoping for to demonstrate typing letters (they started learning the alphabet just a few month earlier, so they loved it) and how to move “the little arrow” using the “square” (trackpad). I then showed the (unplugged) MaKey MaKey board, explaining that it was much the same inside the computer. And then I explained that we were going to type letters using… carrots! At this point, I took a first group of 4 to another room (I had the option to stay in the classroom or in a corridor next to it, but I was concerned that it would draw the attention of too many children). I had the grand plan to demonstrate how to do stuff with bananas, carrots, gummy bears, plasticine, aluminium sheets, wet pieces of paper… Of course, this hit the reality wall after just the first group. In the end, here is what works in 10-15 mins. 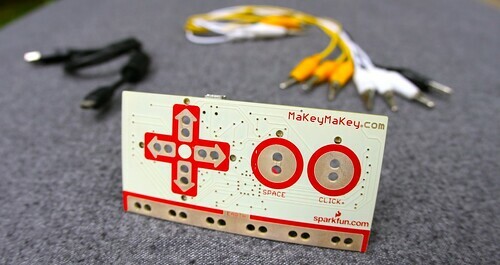 open the scratch project “MaKey MaKey Piano“; note that you’ll need internet access for this. What sounds trivial in a different context is made harder at kindergarten where such infrastructure is not available. In my case, I opened the web pages at home in advance (simply making a local copy didn’t work). As a backup, I also set up my phone as a wifi hotspot with 3G connection. make the kids hold the “earth” wire in one hand, and touch the carrot in the other. Music! This was all done in groups of four children, two per computer. Managing all that by myself was very feasible (the teacher was in the classroom with the rest of the class). The children had lots of fun! The teacher liked it too, although she was not able to see first hand how it worked. As for me, I liked the fact that I managed to teach a couple of simple concepts, let the children enjoy themselves, and teach them it’s OK to tinker with computers. Also, I got to show off as a cool dad to my daughter and her friends! For more pointers on to computer-related stuff that can be done with kids of all age, check out my github page (in French): Initiation à la programmation pour les enfants. If you understand French and want to hear more about the Catch Exception library, you might be interesting in this podcast episode I recently published. This is an excerpt of a chapter I’m writing for the upcoming CITCON Chronicles book. For example, until version 4.0, JUnit required that test classes extend a special class, TestCase, and that test methods start with a special prefix. These constraints felt rather arbitrary (in truth, they were present mostly for technical reasons) and were replaced with annotations in later versions of JUnit. In contrast, unit testing your production language in a different language (as advocated here, for example) will require you to adjust your mental state every time you switch from production code to unit test code. Instead, I want as seamless a transition as possible, as I’ll frequently switch from one to the other, especially when practicing test-first style development. The same advice applies when considering Behavior-Driven Development (BDD) frameworks that come with their own language or formalism such as Cucumber and FitNesse. Although those may have value as acceptance test environments, using them for unit testing will slow down the feedback cycle created by quickly going from reading/writing tests to reading/writing production code. I’d even argue that this aspect of their design is a drawback to doing other forms of testing. Although there are not many of them yet, it is worth putting some effort into finding a high-level test framework that works directly in your favorite programming language (one such example for BDD is Narrative). Finally, notice how proficient you are in your production code? That comes from years of practice. It also comes from a productive development environment. Use those to your advantage. This is an excerpt of a chapter I’m writing for the upcoming CITCON Chronicles book. In production code, common coding standards for Java recommend writing method names in CamelCase. This makes sense when those methods are called from our own code. It feels as if requests are being made to these objects (dear “bankTeller.createABankAccount()”, please). Besides, it follows the conventions in the Java Development Kit and with other projects, making it easy for newcomers to feel at home. However, methods in unit tests are not called by us. They do not need to represent requests. They also have less pressure to look similar to other public APIs. They do need to tell a story, and a story is best told with space between words. We cannot put spaces in method names, but underscores come close. TL;TD: Refactoring classes that have data envy is easy. Do it. If you’re like me, you’ll cringe at the sight. In fact, this is a classic case of Data Envy. On the Mockito mailing list and on Stackoverflow, there are a significant number of questions that actually reveal that the person asking did not perfectly understand what the Mockito annotations do. Indeed, the annotations are rather magical and their behavior is definitely not obvious. Since they are mostly syntactic sugar (although whether they actually improve readability is debatable), my recommendation is to do without them entirely. Here are a few examples. This post in an introduction to Fantom via the refactoring of Java code. Week 2 of the Seven Languages in Seven Weeks book is about the Io Language. Day 3 is more specifically on how the flow of control (how messages are passed to an object or to its parent) can be hijacked to create a DSL. Apache VFS is a great way to access different file systems in the same way. I particularly like the custom RAM filesystem in my unit tests in order to check code that eventually accesses the actual file system. Annoyingly, Apache VFS API provides a way to check if a file/folder is hidden, but, although it is always possible to manually create hidden files on your system, there is no way to mark a file as hidden in the RAM filesystem. “Adding manpower to a late software project makes it later”. The so-called Brooks’s Law on productivity of software project is well known, since Fred Brooks’ seminal work The Mythical Man-Month, first published in 1975. That is one of the reasons I’m wince a little when a company talks about plans to hire lots of software developers.